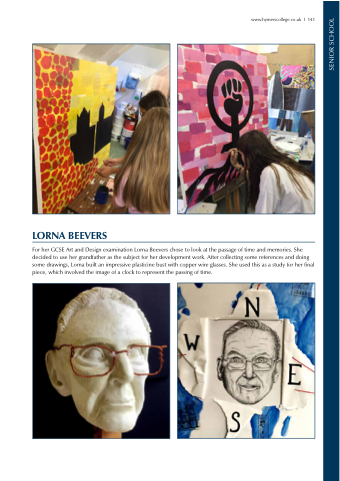 For her GCSE Art and Design examination Lorna Beevers chose to look at the passage of time and memories. She decided to use her grandfather as the subject for her development work. After collecting some references and doing some drawings, Lorna built an impressive plasticine bust with copper wire glasses. She used this as a study for her final piece, which involved the image of a clock to represent the passing of time.